The genus name, Ulmus, is the ancient Latin name for this family of trees. The species name, rubra, is Latin for "red." Slippery elm is a deciduous tree native to eastern and central North America. It usually grows between 20 and 60 feet in height. The brownish gray bark is deeply furrowed. The leaves are simple, alternate, 4 to 6 inches long, olive green on top and lighter below, toothed unequally, and covered with hairs on both sides. The rust-colored leaf buds are followed by dense clusters of sessile flowers of red anthers with purplish red stigmas that appear before the leaves have come out. The seeds are yellowish green, winged, and papery, with no hairs on the margins. The tree grows in open areas with full sun to partial shade and where the soil is moist and firm. Elm trees, including slippery elm, have been subject to the fungus known as Dutch elm disease (Graphium ulmi), which is carried by a beetle and congests the trees' circulatory system. Elm trees are therefore becoming endangered, and using slippery elm in quantity can contribute to their demise. Marshmallow root can be used as a substitute in many cases. Slippery elm was an important remedy for both the Native Americans and the settlers of early America. This herb moistens, clears heat, neutralizes overly acidic conditions, and provides nourishment. It soothes and heals any part of the body it comes in contact with and is used to treat inflammation of the bladder, bowel, kidneys, lungs, and stomach. It is an ingredient in the anticancer formula Essiac, originally an Ojibwa formula that a Canadian nurse, Rene Caisse (Essiac spelled backward), popularized. Slippery elm is used in the treatment of acid indigestion, AIDS, appendicitis, bipolar depression, bronchitis, colic, colitis, convalescence, cough, debility, diarrhea, diverticulitis, dysentery, gastritis, hemorrhoids, hoarseness, laryngitis, irritable bowel, nausea, nephritis, nervous breakdown, pharyngitis, pleurisy, pneumonia, sore throat, starvation, tuberculosis, typhoid, tumors, ulcers, underweight conditions, urinary tract inflammation, wasting diseases, and whooping cough. 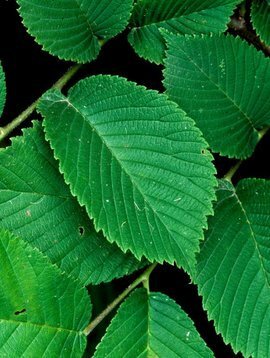 Topically, slippery elm can be used as a poultice to treat abscess, bedsores, boils, burns, diaper rash, eczema, eye inflammation, gangrene, splinters, and wounds. It also can be added to enemas or suppositories to soothe irritated bowels or to lubricate dry intestines or to vaginal boluses to treat inflammation. It is so demulcent that midwives have used it as a hand lubricant when checking a baby's position in the birth canal during labor. Slippery elm bark is very nutritive. It is most often powdered before consumption, after which it can be eaten as a gruel, like oatmeal, that can be flavored with cinnamon, raisins, honey, and so on. Slippery elm is very easy to digest, and so it is especially beneficial for people who can't keep any other food down, such as those recovering from illness or undergoing chemotherapy. It can help nourish those who are wasting away, failing to thrive, and losing weight. It can be added to baby food as a nutritive and to nourish recently weaned infants or those who can't digest milk. It also is popular in lozenges designed to treat sore throat and coughs. The leaves and immature fruits of the tree are also edible, raw or cooked. Slippery elm is sometimes added to cosmetics as an emollient. Used as a binder, it holds herbal tablets together. At one time the bark was added to fats to prevent rancidity. The inner bark is strong and fibrous and can be made into cordage for bow strings, bow drills, rope, clothing, mats, jewelry, roofing, wagon wheels, and even musical instruments. The powdered herb makes great tinder in starting fires. Slippery elm is regarded as one of the safest herbs. When consuming slippery elm in capsule form, be sure to take in plenty of fluids, as it absorbs moisture in the body and can be dehydrating.